« A Delicious Slice of Johnners. Brian Johnston began to take an interest in cricket when he was about six. One day his eldest brother Michael threw him a tennis ball and shouted, ‘I’m Jack Hearne, you’re Patsy Hendren.’ From that moment on Patsy became Brian’s hero and he had embarked on a lifelong love of the summer game. Following the success of A Delicious Slice of Johnners, Barry Johnston has edited another delightful anthology based on three of his father’s most popular books, Brian Johnston’s Guide to Cricket, Chatterboxes and It’s Been a Piece of Cake. 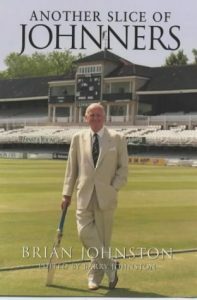 Another Slice of Johnners is a witty and affectionate collection of anecdotes and reminiscences about Brian Johnston’s fellow commentators, his selection of the six most exciting Test matches and his all-time favourite cricketers, from Len Hutton and Denis Compton to Ian Botham.